Another great way to add a chic personal accent to your special event is custom bottle labels. From bridal and baby showers to birthday parties or even beach house or lake gatherings, adding a custom label to any beverage available to your guests is a simple and cost effective way to personalize the special occasion. Water bottle labels are an obvious choice, but you can also add labels to other beverage options for your guests such as mini soda bottles, bottles of your favorite "vino" or even petite bottles of chocolate milk that can be served at a milk and cookie bar, which by the way is one of my favorite new wedding trends. 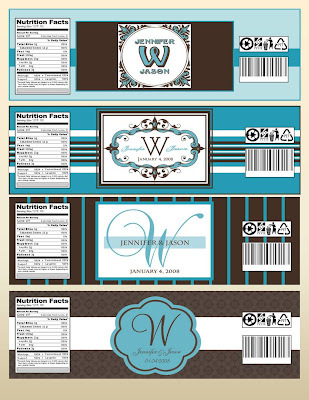 Below are some water bottle labels that I created for Jennifer and Jason for their upcoming wedding. I created a variety of custom monograms in their wedding color palette of turquoise and chocolate brown and then integrated the same monograms within four different label designs that they will use to embellish the water that they will serve to their guests on their special day.